San Camp sits serenely in a reef of palm at the edge of the world.You can see the curve of the earth here. Turn 360° and nothing crosses the eye but the bowl of the sky. 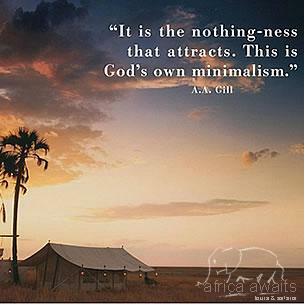 It is the nothing-ness that attracts. This is God's own minimalism. A safari to San Camp is also a complete desert experience focusing on species unique to the area such as aardvark, gemsbuck and springbuck. San Camp offers the Earth, stripped naked. And, such restraint holds its own charms. And this place could not be more different from everywhere. San Camp is the Stewart Granger Memorial Collection of 1940s safari tents, with bucket showers, flush loos, four-poster beds, mosquito net canopies, percale sheets, and paraffin lamps. There is no electricity at San Camp. Six white canvas tents twinned with a dramatic location, combine to create an oasis of civilization in what can be the harshest of stark environments. 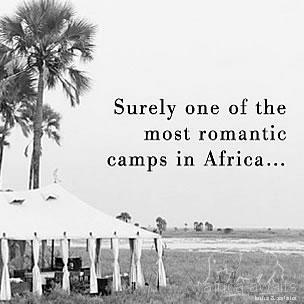 The result: One of the most romantic camps in Africa!" Jack's Camp and San Camp are unique in that they are the only permanent camps to offer a chance to explore and understand the Kalahari. 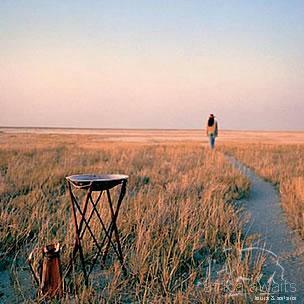 Our concession adjoins the Makgadikgadi National Park with its endless vistas of rolling golden grasslands. Desert palms line the horizon… Through the tent flaps, the Makgadikgadi Pans run over the horizon like the mother of all Norfolk beaches. A relic of one of the world’s largest super-lakes, the Makgadikgadi dried up thousands of years ago as a result of the continued shifting of the earth’s crust. When the lake was formed, some five to seven million years ago, its shores were the setting for the mysterious transition from ape to man. Venturing far into the centre of the Makgadikgadi, on 4wd quad bikes, we are able to explore remote archaeological sites, periodically discovering never before documented fossil beds of extinct giant zebra and hippo. The fact that you can travel across the pans at great speed and still arrive nowhere only underlines the pans immensity. There is nothing out here. Absolutely nothing. No outcrops, no features, no grass, no trees, no sound but the crunch of your boots in the crust. The Kalahari desert is its own universe. It is the only place where guests are virtually guaranteed to see the rare and elusive brown hyaena and be able to walk through the Kalahari with a gang of habituated but, wild meerkats! The Guides at San and its satellite, Jack's Camp, are an erudite breed. Often graduate students who combine research with guiding, they team up with a small group of Zu/’hoasi Bushmen to guide our Guests on a morning’s walks and game drives. The ancient lake has run dry but, the imagination runs wild. With your holiday, safari or business trip from in to San Camp in Botswana.